I know Halloween is shunned by many Australians, but I don’t care! I love it; I love the lead-up and the fact you can get fantastic decorations from just about everywhere these days. The streets around my home have been getting more and more involved in Halloween over the past few years, and it has been fantastic, so even though my kids are a little older, I can still entertain the children from my neighbourhood. Did I mention I love a themed event? You don’t need to spend a fortune to create fun little treats for trick or treaters. But that doesn’t mean you can get lazy and just fill bowls with chocolate bars and hope for the best. Set an afternoon aside and get crafty, a little planning can go a long way another is nothing better than seeing a happy face with a spooky treat in hand. 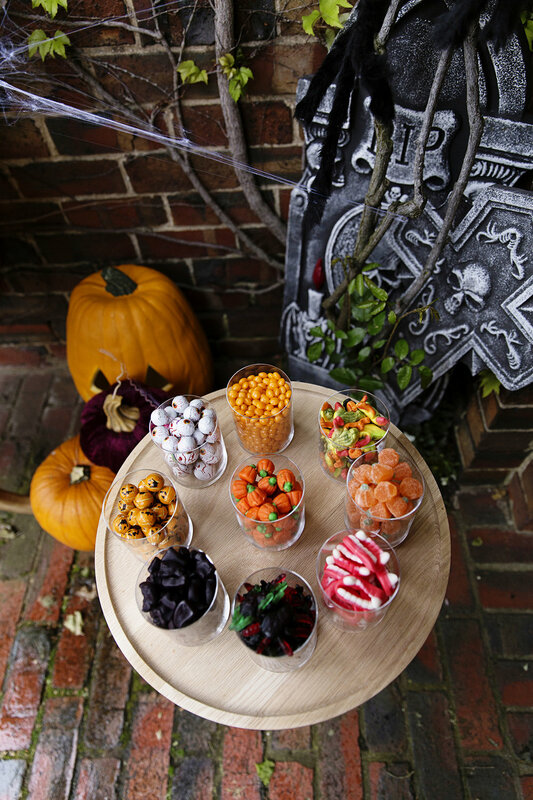 Simple ideas like bags of cheese and bacon balls, adding black food dye to your toffee for toffee apples, glasses holding an assortment of spider lollies and teeth; it’s little-themed touches like this that make everything that little bit more special. All these treat ingredients are from the local supermarket and $2 shop, and by taking cues from the ideas below I am sure you will come up with some fantastic versions on your own. Chocolate cupcakes have never looked so fun! Split and oreo for eyes with a dab of icing, an orange smartie (or any lolly for that matter) for the beak and hoot hoot! A cute idea is to go online and find great old poison labels that you can download for free. I have printed them off in B&W and stuck them on old milk bottles. Drinks that go in them can range from red wine to adding some food coloring in for the kid's drinks. I have used black food coloring to make the drinks dark and mysterious, but actually, it’s up to you! Is there nothing a chocolate pretzel cannot do? Look at these cute little legs and yes, I know - spiders have eight legs but not here because I ate them! Chocolate covered sponge cakes with little marshmallow eyes and crunchy pretzel legs are a kiddy favorite. 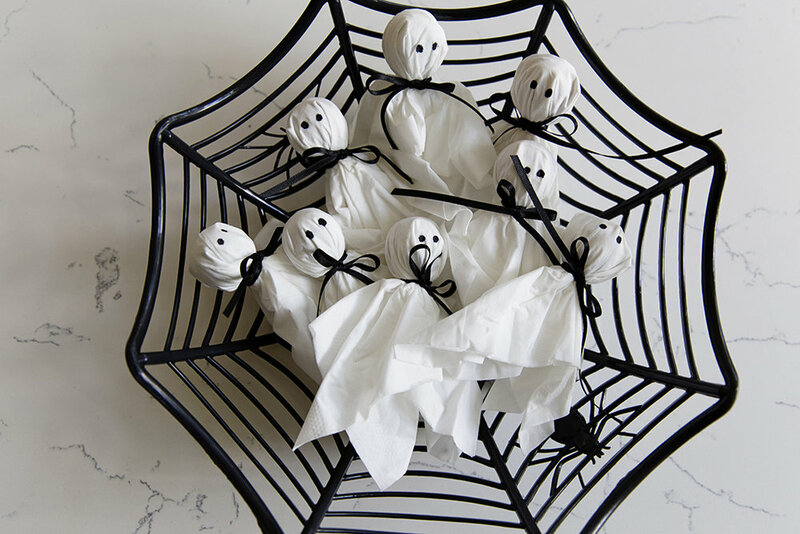 This lolly bag is so simple to make, and the perfect take home lolly bag if you are having a Halloween party. It is just using disposable rubber gloves and filling them with an assortment of themed lollies. Tying the end off with a black ribbon and decorating it with a spider ring you can get from any party shop or $2 shop. If you have kids trick or treating, these ghosts are quite simply a white tissue wrapped around a lollipop with text’s using for eyes. These are perfect for those little door knockers, cheap and cheerful! Time to get the apron on! Photos: Lisa Atkinson, Copyright © Chyka Keebaugh.